Out of the many troublesome errors that we come across in Android, Error 505 is one of the common ones. It is an error produced by the Google Play store when installing or updating apps. A message box opens up which says Unknown error code during Application install: -"505". The problem is prominent in phones with Android 5.0 Lollipop. If you want to fix Error 505 in Android then there are multiple ways that you can try. There is no single fix for it and different users find different error solving methods for error 505 seem to work for them. The methods include restarting your phone (simplest method) to factory resetting your phone (wipes everything). The basic or the simplest thing that you can do when any electronic device breaks is to turn it off and then on. It is the same thing with your phone. Turn it off and turn it on. The same goes for the Wi-Fi connection. Try disconnecting and connecting your internet in your phone as well as turning off and on the Wi-Fi router. If you are using data, then try doing the same for it i.e. switching it off and then on. A few lucky users might find that this simple fix will work for them. 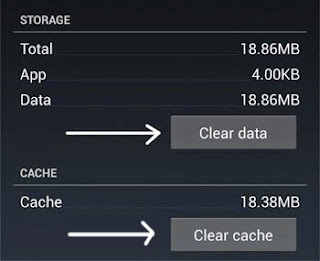 The cache and data of Google Play store has different information and files related to app installation. So, you can try clearing the saved cache and data. Find the option that says Apps and tap on it. Scroll right towards the tab that says All. In the list of all apps, scroll down to find and tap the one that says Google Play Store. Within the next screen, click on Clear Cache and then on Clear Data. Now try installing or updating that app that was facing the Error 505 issue. It should work. If nothing else works for you, you can try resetting your phone to its factory settings. Note that everything is wiped off and you will have to set up the phone as if it were new. In Android’s main settings under Backup & reset, tap on the option that says Reset phone. Confirm your action and wait for the device to restart and reset. This hard factory reset option is accessible from the recovery mode of Android devices and is used if you cannot access Android’s settings. You will have to turn off the device and then press a combination of volume and power key to start in this mode. The combination might be different in different OS versions and devices. Press the physical power and volume up button to turn it on. Use the volume button to navigate to Recovery mode and use power button to enter. In the Android repair screen, press the power button and volume up and then release them. Use the volume buttons again to navigate through the options and choose the one that says Wipe data/factory reset while using power button to confirm. Your phone will erase everything. When it starts, you will have to add a new Google account, download the apps and copy your files again. Hope one of these methods worked for you. Let us know which one in the comments.